This guide describes the preparation steps required to configure and integrate a shared Virtual Private Cloud (VPC) on Google Cloud Platform (GCP) with Pivotal Cloud Foundry (PCF). 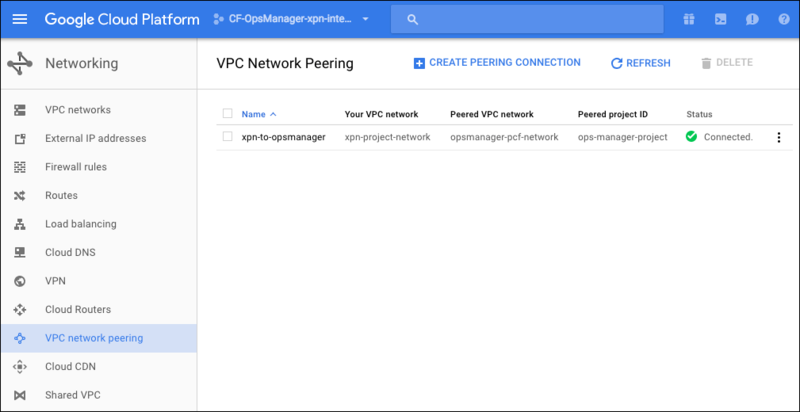 GCP Shared VPC, formerly known as Google Cross-Project Networking (XPN), enables you to assign GCP resources to individual projects within an organization but allows communication and shared services between projects. For more information about shared VPCs, see Shared VPC Overview in the GCP documentation. GCP Console: From https://console.cloud.google.com, click the Organization dropdown at the top of the page to display all organizations you belong to. gcloud Command Line Interface (CLI): From the command line, run gcloud organizations list to display all organizations you belong to. See gcloud Overview in the Google documentation to install the gcloud CLI. For more information, see Creating and Managing Organizations in the GCP documentation. If you do not have a Cloud Organization, contact GCP support. Follow the Enabling a shared VPC host project procedure in the GCP documentation. This procedure requires shared VPC admin permissions. You can use the GCP console or the gcloud CLI to connect the shared VPC host project with Ops Manager. 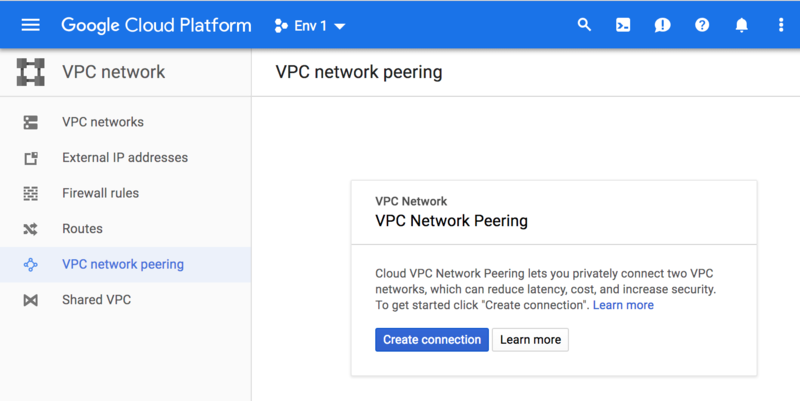 For more information, see VPC Network Peering in the GCP documentation. WARNING: VPC Network Peering is currently in beta and intended for evaluation and test purposes only. From the GCP console, click Networking, then VPC network peering. Enter a name for the network connection from the Ops Manager project to the new shared network, such as opsmanager-to-xpn. Enter a name for the network connection from the new shared network to the Ops Manager project, such as xpn-to-opsmanager. OPSMANAGER-TO-VPC: Choose a name for the connection, such as om-to-vpc. OPSMANAGER-NETWORK: Enter the name of the network assigned to the Ops Manager project in GCP, such as my-om-project. VPC-HOST-PROJECT: Enter the name you gave the shared VPC project in Step 1: Provision the Shared VPC. VPC-NETWORK: Enter the name of the network you gave the shared VPC project in Step 2: Create Shared VPC Networks. VPC-TO-OPSMANAGER: Choose a name for the connection, such as vpc-to-om. OPSMANAGER-PROJECT: Enter the name of the project that contains your Ops Manager installation. OPSMANAGER-NETWORK: Enter the name of the network assigned to the Ops Manager project in GCP. After configuring a shared VPC, use the following procedure to verify that the shared VPC host project VM appears in the Ops Manager project. From https://console.cloud.google.com, select the Ops Manager project from the drop-down menu at the top of the page. Click Networking, then VPC networks. Confirm that the shared VPC network name appears in the Subnets list. Confirm that the shared VPC network IP address ranges match what you set for the new VPC project in Step 2: Create a Shared VPC Network.